Today I discussed the alternatives to buying your meals on board Air Canada flights within North America. For a list of food service establishments at the Vancouver airport, most of which package food to go on board, visit the YVR website. I also spoke about Lock&Lock airtight containers. My wife introduced me to these storage containers and they really are the best I've ever used. They are made in Korea, and we have purchased them at Home Hardware and Canadian Tire stores. You might also want to try the take-out food on the 'allo Provence to go' menu from Provence Marinaside in Vancouver's Yaletown. You never know what you'll find on the Internet, and this week I came across a link that will sate most appetites regarding airline food. It's at a curious yet intriguing website called airlinemeals.net. Take a flyer on it! In this episode I tour the aisles of a vast cookware shop with Christopher Kimball, the driving force behind Cook's Illustrated Magazine and America's Test Kitchen. 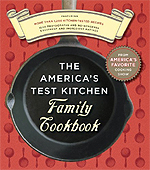 The new book Christopher was promoting in Vancouver is called The America's Test Kitchen Family Cookbook. I have two copies to give away...you just have to tell me about your favourite piece of kitchen equipment or cookware. Enter by going to my blog. And check My Podcasts for my entire conversation with Christopher Kimball. Coming soon! Today I featured a tour of Clear Creek Distillery in Portland, Oregon, which makes excellent brandies, eau de vies, grappas and Pear in a Bottle! A visit to Caffe Pacori and Caffe Botanic in Eugene, Oregon. For functional coffee closer to home in a ground format, visit Fusion Coffee from North Vancouver. 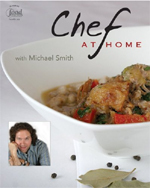 Chef at Home Michael Smith visited my kitchen for this episode, to cook from his latest book, Chef at Home: Cooking With and Without A Recipe. It's published by Whitecap Books $29.95. Click on the book to purchase at a discount from amazon.ca. You can also enter a contest to win one of two copies. Go to my blog and tell me about a favourite 'no recipe' dish you like to cook.